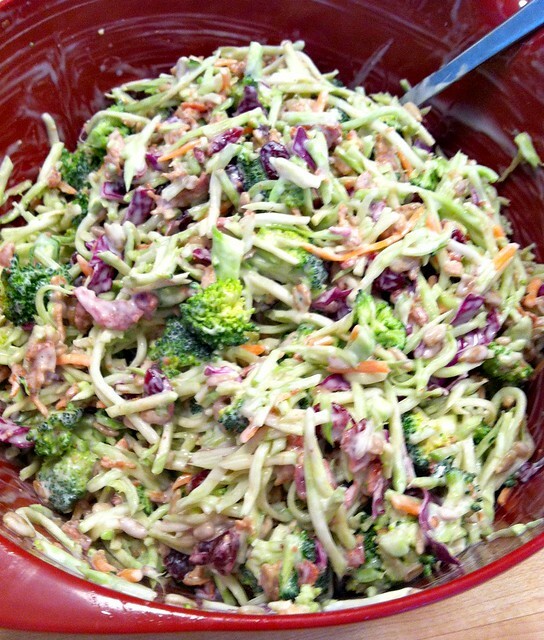 Although I absolutely LOVE cooked cabbage, I’ve never been a huge fan of coleslaw — even the really good homemade stuff. If someone serves it to me, I’d eat it — but I’d never choose it on my own. However, when it comes to BrocoSlaw, I’ll almost always go back up for 2nds or even 3rds. I love the stuff! 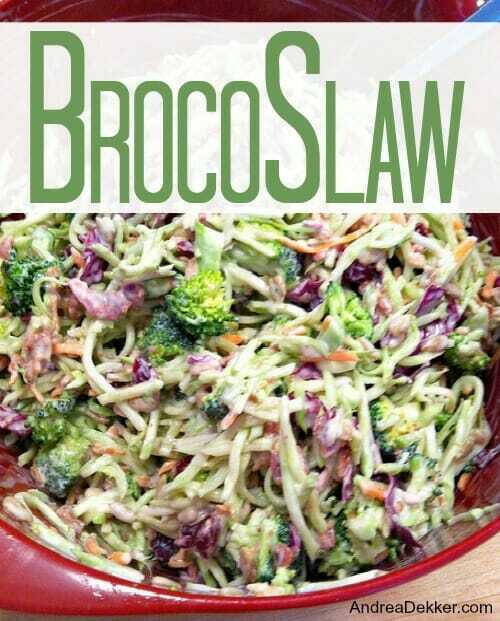 BrocoSlaw is such a simple side dish to make, and it’s versatile enough to work with backyard BBQ’s, a simple sandwich buffet, or even a ham dinner. **I often add all the optional mix-ins as I love the sweet and salty together. 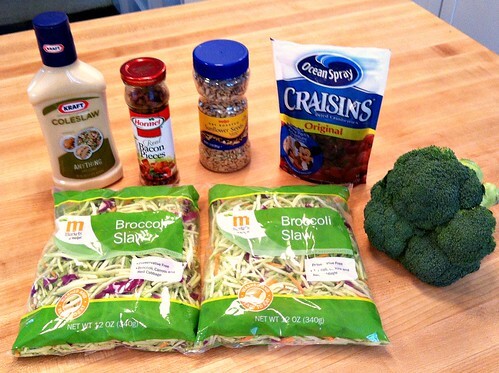 Mix all ingredients together in a large bowl (reserving a little of the dressing for later if necessary). Stir well before serving and add more dressing if needed. I made this as a side dish for Nora’s birthday party, and several people asked me for the recipe — so I know I’m not the only one who loves this simple side dish. Not only is it really easy to make and delicious, it’s also easily customizable for your own tastes, and it can be made several hours ahead of time so there’s no last-minute prep work — making this the perfect dish to bring along for holiday parties or other functions. What are your favorite make-ahead side dishes? Yikes. I hope this will hold for 20 hours. I just made it and will serve it tomorrow around 6pm. Will it be really soggy? This looks great!! So easy too. When you add in a dried fruit, do you ever add in the bacon as well? Just wondering how they’d pair together….or what do you think are the most popular/tastiest add ins of the optional ones you listed? Good question Amy — and yes, I usually add ALL the optional mixins in each batch. I love the sweet and salty together! I make my broccoli slaw with pineapples and raisins. I can’t get enough of it! I love this made as a ceaser salad. This is one of our favorite as well. I make my own dressing with Miracle Whip, sugar and vinegar. 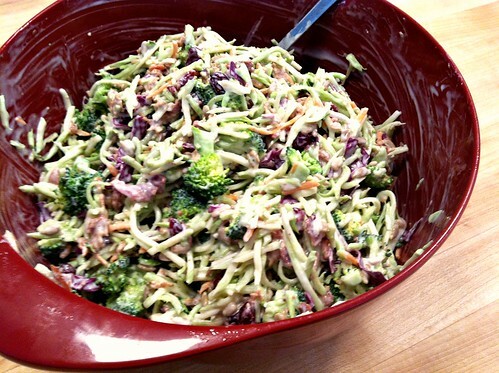 We also use broccoli slaw in stir-fry, and we often finely chop it and add to veggie pizza (the cold, appetizer kind). Thank you! I had this at a dinner a few months ago and loved it, but I thought it would be harder to make so I didn’t ask for the recipe, now I see it’s actually very simple!